- Mike Bordick, one-time member of the Y-D Red Sox who played 14 years in the big leagues and has given back to his Cape League team to the point where a plaque hangs in his honor at Red Wilson Field in Yarmouth. - Jeffrey Maier, current assistant to Peter Gammons who as a 12-year-old in 1999 famously gave Derek Jeter an ALCS home run against the Orioles by reaching over the Yankee Stadium fence and deflecting the ball into the stands. - Andrew Wirtanen, fellow keeper of a baseball blog, purveyor of a kind review of my Cape League book, and poster of a fun video clip capturing the Y-D Red Sox’s winning moment. 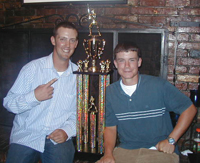 Y-D pitching star Terry Doyle (Boston College) and bullpen catcher Joe Abarr pose with the Cape League championship trophy at the Y-D victory party, held at the Riverway Restaurant in South Yarmouth after the penultimate game. Thanks for the links, and the non-BoSox related post! I also have a lot of photos online from games. I would be interested in seeing in your photos too, Steve... do you share them online anywhere (besides the small images on your blog)? In related news, did anyone notice that the 2006 Falmouth Commodores baseball cards are currently selling for $20.50 on eBay (with over a day to go)?